I am testing several laptops with Windows 8.1 installed. One of the tests is to measure how much the battery lasts. For this task I use benchmarks like PeaceKeeper or PowerMark. I also want to measure how long it takes for the battery to charge itself to 100% after it gets depleted. Any ideas on how to do that? 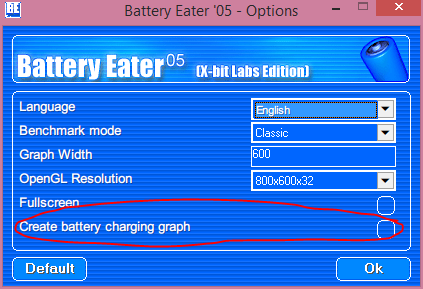 Battery Eater supports creating a battery charging graph. It also logs the current battery capacity every 30 seconds during a discharge benchmark. I suppose it also logs this information while creating the charging graph. To open the BEG files it generates, drag-and-drop them into the Battery Eater executable file. Also, since this is pretty old software, you may need to run it in Compatibility mode. Not the answer you're looking for? Browse other questions tagged windows laptop battery battery-life or ask your own question. How to measure the power consumed by a program in Windows? How can I set a 80% battery charge limit for a HP Ultrabook?